IP ratings are developed by the European Committee for Electro Technical Standardization (CENELEC) (NEMA IEC 60529 Degrees of Protection Provided by Enclosures - IP Code), specifying the environmental protection the enclosure provides. This classification system utilizes the letters "IP" ("Ingress Protection") followed by two or three digits. The first digit of the IP code indicates the degree that persons are protected against contact with moving parts (other than smooth rotating shafts, etc.) and the degree that equipment is protected against solid foreign bodies intruding into an enclosure. Protected against solid objects over 50 mm, e.g. accidental touch by persons hands. Protected against solid objects over 12 mm, e.g. persons fingers. Protected against solid objects over 2.5 mm (tools and wires). Protected against solid objects over 1 mm (tools, wires, and small wires). Protected against dust limited ingress (no harmful deposit). Protection against vertically falling drops of water e.g. condensation. Protection against direct sprays of water up to 15o from the vertical. Protected against direct sprays of water up to 60o from the vertical. Protection against water sprayed from all directions - limited ingress permitted. Protected against low pressure jets of water from all directions - limited ingress. Protected against temporary flooding of water, e.g. for use on ship decks - limited ingress permitted. Protected against the effect of immersion between 15 cm and 1 m.
Protects against long periods of immersion under pressure. (e.g. 150 g weight falling from 15 cm height). (e.g. 250 g weight falling from 15 cm height). (e.g. 250 g weight falling from 20 cm height). (e.g. 500 g weight falling from 40 cm height). (e.g. 1.5 kg weight falling from 40 cm height). (e.g. 5 kg weight falling from 40 cm height). The chart below illustrates the use of special symbols in the IP classification system. Note the images beside numbers 5 & 6 in the "1st Digit column. In the bottom left hand corner there are small, grid like symbols. In the same bottom left hand corner for the images beside numbers 3 to 8 in the "2nd Digit column, there are tear-drop like symbols (sometimes enclosed in a box or triange). 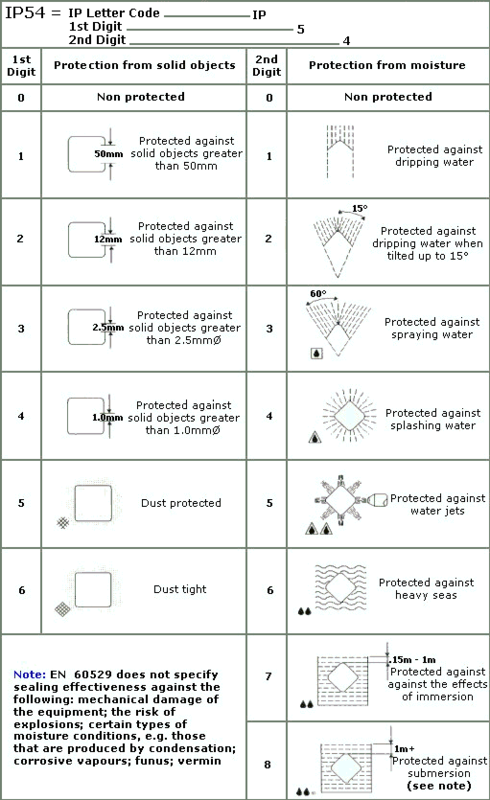 These symbols can be placed on equipment to illustrate the IP protection provided.